Well, really three challenges. But that didn't flow as nicely. I have never participated in a challenge before, but with Studio Calico's series of CHA challenges, I figured it was as good a time as any to start!. 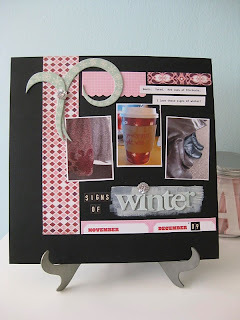 This first layout was part of the "whitewash" challenge--can you spot it? This page has been lurking in my head for months, biding its time (sounds a bit stalkerish, but its true) and I'm glad to have it down on paper now. 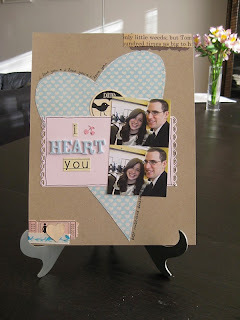 This next layout was part of the hearts challenge, which I was a big fan of. I like hearts. This page was inspired by a Linda Sobolewski (I'm probably spelling this wrong--sorry Linda!) 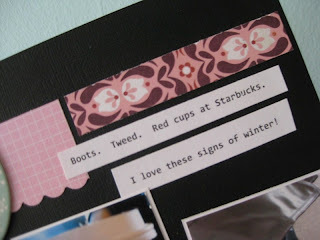 page I saw in January's Scrapbook Trends. Which you should check out, because the page was awesome! And that's it for this week. I have another page in the works, but it involves a lot of techniques I don't know how to do, so it's a little dicey. PS--If you don't usually comment, feel free to pop in! I love "meeting" new people through the blog! PPS--If you are aware of some black market for Dear Lizzy products, and you let me in on it, I'll be eternally grateful! Purely legal, of course:) Hee hee. Cute layouts. I like the big heart! very cute. love the heart too and very cool its BLUE. Love the pages!! I always want to do some challenges but never do. I should!! Have a good weekend!! Love the layouts... and LOL about the black market lookout!!! I feel the same way... I can't wait to get it all! !